After resuscitating a season that started on life support, Highlands played host to a Pulaski Co. team that ended the Bluebirds' run. Simon Kenton had blown through the season, annihilating most opponents and entered Friday night's game against (Lexington) Lafayette undefeated. The Pioneers' record now has one blemish as the dream run in Independence came to a sudden end. Not all is lost, however. Newport Central Catholic and Beechwood will carry the Northern Kentucky banner to Bowling Green as the Thoroughbreds and Tigers return to familiar championship territory. Newport Catholic is headed back to the Class 2A State Finals after a hard-fought 15-7 victory vs. Danville Friday night at Newport Stadium. Each team slogged through a sluggish, penalty-laden first half in which New Cath did not cross the 50-yard line and Danville had two would-be touchdowns nullified by penalties. On its second possession of the opening quarter, Admirals’ junior quarterback Zach Dampier’s 40-yard touchdown pass to sophomore D’mauriae Vancleave was wiped out because of an ineligible man downfield penalty. Two plays later, New Cath junior Trent Wrobleski recovered an Admirals’ fumble. Following a Thoroughbreds punt, Danville drove deep into New Cath territory, keyed by runs from senior Stephen Ray but let another scoring opportunity by the wayside. On third-and-goal from the one-yard line, Ray slipped immediately to the turf after taking a pitch left side from Dampier. On the ensuing play, Admirals’ kicker Corey Steber missed a 21-yard field goal off the left upright. After one quarter, it was 0-0. Each team traded punts to begin the second. After a New Cath punt gave Danville good field position at its own 46 to begin their next drive, Vancleave took a reverse 54 yards for a touchdown on the Admirals’ first play from scrimmage, only to have it nullified again – this time because of holding. But despite the Admirals’ misfortune in the first half, the Thoroughbreds were unable to capitalize on their opportunities, going into halftime with 33 rushing yards and 38 passing. Neither team was able to break the stalemate into the third. The Thoroughbreds opening drive of the quarter began with an eight-yard pass completion to Wrobleski, followed by a 10-yard Smith run. But, any momentum was stopped there, as the Admirals’ defense tightened up and stopped Smith for a loss on second down and junior quarterback Pat Henschen’s pass fell incomplete on third, forcing a punt. Danville was unable to take advantage of an unsportsmanlike penalty on New Cath junior Job Freppon on first down of its next drive, as Dampier was sacked by Thoroughbreds’ senior linebacker Kobe Tallon, followed by a short pass completion that did not make up the lost yardage. Though it was forced to punt, the Admirals received the ball back immediately, as New Cath senior Josh Schneider fumbled with Danville players surrounding him and ultimately recovering at the Thoroughbreds’ 20. Following Ray runs of eight and two yards each, senior Jakobi Turner took a handoff 10 yards around the right side, slipping through several New Cath tacklers on the way to the end zone, finally breaking the 0-0 tie with 6:08 left in the third quarter with a 7-0 lead, which it would hold on to until late in the fourth. 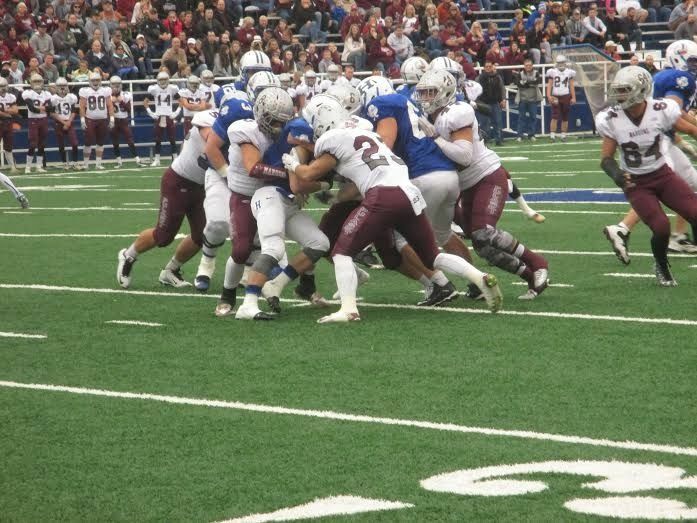 Nearly halfway through the fourth quarter, New Cath was unable to convert a fake punt on fourth-and-10 just inside its own territory but held Danville on their possession, opening up what turned out to be the 81-yard game-winning drive. Henschen kept the ball himself for 13, followed by a 15-yard catch by senior Erik Anderson and another first down. Henschen then made arguably the game’s biggest play to that point: Scrambling left with a defender hanging on his leg, the junior lobbed the ball to a wide-open Smith for a 36-yard completion down the left side. Several plays later, Smith took a handoff five yards for a touchdown run with 2:52 remaining. Then on the ensuing play, seeing it was lined up to go for two, Danville called timeout. Out of the brief break, New Cath lined up for two yet again, a decision Thoroughbreds’ Head Coach Dan Wagner said he did not second guess. “No…nope. I figured if it got into a 10-yard game (overtime) we weren’t moving the ball that well so we were going to take our shot at it and Pat made a hell of a play,” he said. Smith received the initial handoff from Henschen, ran right, then threw the ball back left to a waiting Henschen on the left side of the developing play, who snatched the ball out of the air in the nick of time before Danville defenders closing in could knock it away, diving into the end zone for a one-point lead, 8-7 with just under three minutes to go in the game. The Thoroughbreds’ sealed their second consecutive trip to the State Finals on the first play of the Admirals’ ensuing drive, as Wrobleski picked off Dampier’s first down pass. Smith then crossed the goal line for the second time in less than 20 seconds, capping a wild 15-7 finish. Danville completes its season 12-2, while New Cath faces former Class 1A powerhouse, Mayfield, new class 2A participant this year. The title game will take place on Sunday, December 6 at 1:00 p.m. at Western Kentucky University’s Houchen Industries L.T. Smith Stadium in Bowling Green. The Tigers have been on the road for its past two playoff games but emerged unscathed, first beating (Louisville) Holy Cross last week and then on Friday, knocking off a tough Russellville team. With the win, Beechwood extends its winning streak to 10 and improves its overall record to 13-1, the team's only loss coming in Week 4 to Covington Catholic. Beechwood heads to Bowling Green next week to play for the Class 1A state championship. The opponent will be Pikeville (12-2), who shocked previously undefeated Paintsville (13-1) on Friday. This game will be played on Thursday at 7 p.m. at Western Kentucky University. It was a big night in Independence as (Lexington) Lafayette made the trip up I-­75 to take on Simon Kenton in a Class 6A semifinal matchup. The Simon Kenton faithful packed the stadium hoping to watch the Pioneers punch their ticket to the state championship game. 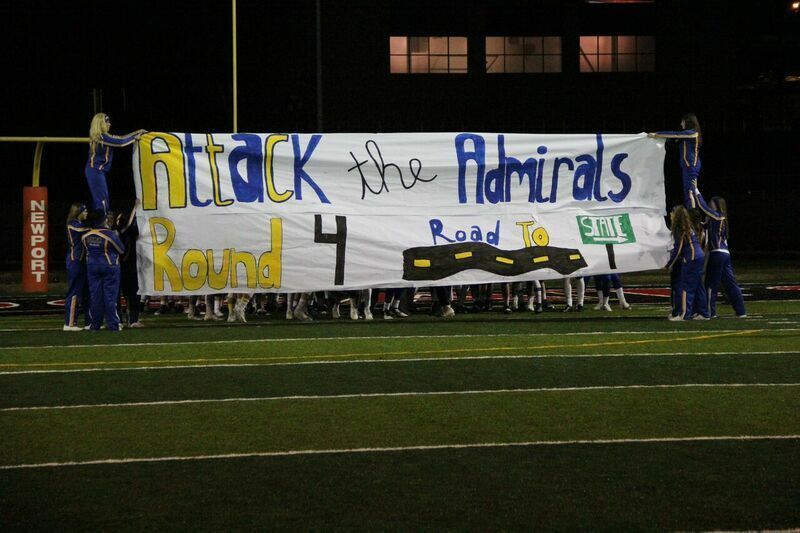 Unfortunately for the Simon Kenton crowd, they left disappointed as Lafayette came out on top by the score of 42­-28. Lafayette got the scoring started with a 4­-yard touchdown pass from quarterback Walker Wood to wide receiver Quinten Brown. The score capped off an impressive 77­yard drive, and it put Lafayette up 6-­0 with 7:47 left in the first quarter. It didn’t take long for Simon Kenton to respond on the ensuing drive. On the third play of the series, quarterback Cam Racke broke off a 44-­yard touchdown run to put the pioneers up 7­-6 with 6:51 remaining in the first quarter. Lafayette got the ball back and were moving down the field with relative ease, but Simon Kenton buckled down and was able to make a stop on fourth down at their own 26­-yard line. 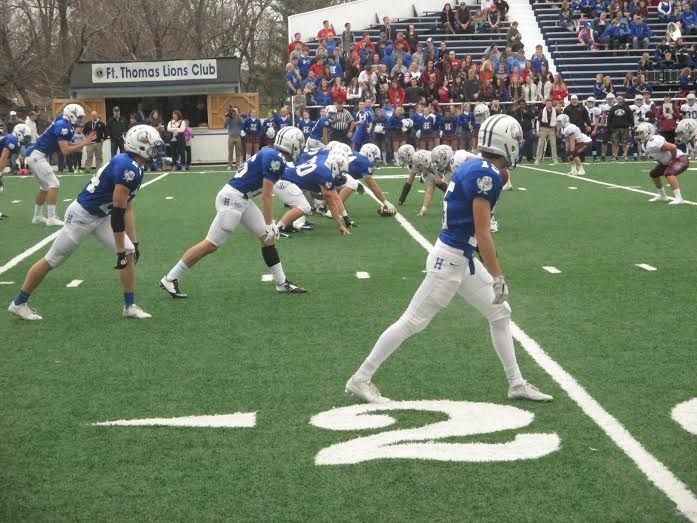 The Pioneers marched the ball down the field and scored on a 34­-yard pass connection between Cam Racke and Logan Scott. With that score, Simon Kenton went up, 14­6 with 2:43 left in the first quarter. Lafayette answered with a big play of their own on the ensuing drive. Walker Wood connected with Quinten Brown for 58­ yards down to the 11-­yard line. Wood ran it in from 4­ yards out two plays later. After another missed two­-point conversion, Simon Kenton still had 14­-12 lead with 58 seconds left in the first quarter. The Pioneers were forced to punt on the following drive, giving Lafayette the ball back with a chance to reclaim the lead. However, Simon Kenton's Casey Mitchell had different ideas as he jumped a slant route and made a diving interception at the 50­yard line. The Pioneers capitalized on the turnover by marching the ball down the field and punching it in from 1­yard out. The touchdown was scored by Cam Racke. It was his second rushing touchdown of the night, and it put Simon Kenton up 21-­12 with 7:00 left in the second quarter. Things were looking grim for Lafayette. On the second play of the ensuing drive, Walker Wood got hit in the backfield and he fumbled in his own territory. 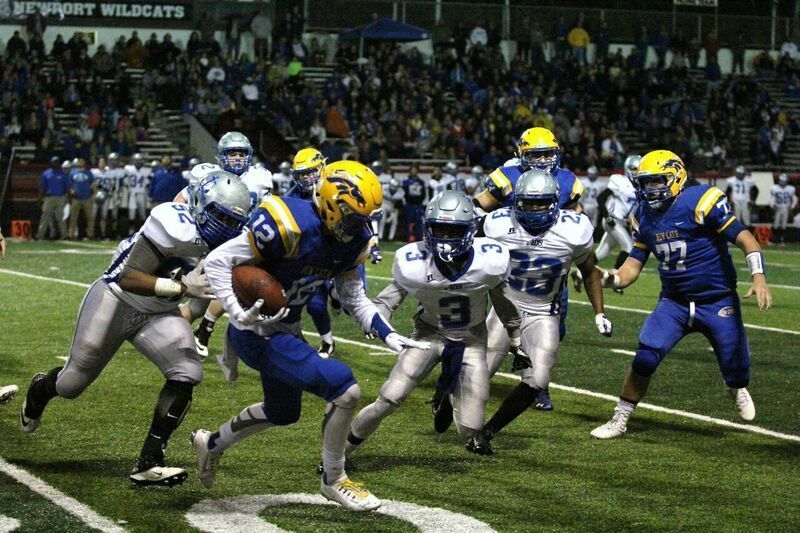 The fumble was recovered by Brian Carter of Simon Kenton and it gave them the ball at the Lafayette 32-­yard line. A few plays later, Cam Racke completed a pass to Tanner Green for an 8­-yard touchdown. 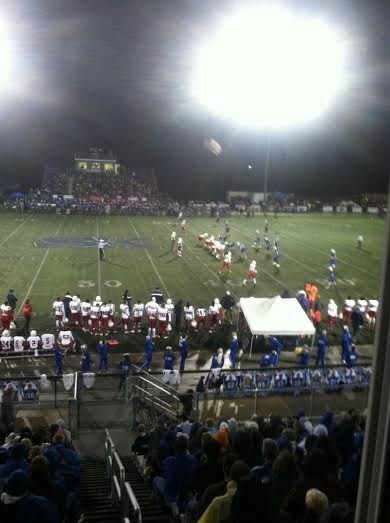 With that score, Simon Kenton went up, 28-­12 with 4:54 to go in the second quarter. Lafayette needed to make something happen before the end of the half if they wanted to stay in the game. They did just that by methodically driving the ball down the field and scoring on a 9­-yard touchdown on a run by Mason Alstatt. The Generals then successfully converted a two­-point conversion to make it a one possession game. The score made it 28-­20 Simon Kenton with 1:24 remaining in the first half. That would end up being the score as both teams headed to the locker room. After an eventful first half, it was a quiet 3rd quarter for both teams. However, with 2:37 remaining in the quarter, Lafayette was able to score on a 6­yard touchdown run from Walker Wood. They were able to convert the two-­point conversion and tie the game at 28­-28. Lafayette never looked back from there. On the first play of their following drive, Wood connected with his favorite target Quinten Brown for an 83-­yard touchdown pass. With that score, Lafayette went up 35­-28 with 26 seconds left in the third quarter. Lafayette’s defense was able to hold the Pioneers for the remainder of the game as they finished off a hard-fought 42­-28 victory against an historic Simon Kenton team. Lafayette quarterback Walker Wood finished 18­ for 30 for 304­ yards and 2 touchdown passes. He also added 104­ yards rushing as well as two rushing touchdowns. Mason Alstatt also had an impressive performance, rushing for 120­ yards and two touchdowns on 26 attempts. Wide receiver Quinten Brown finished with 6 catches for 193­ yards and two touchdowns. Lafayette now sets their sights on Louisville Male for the 6A state championship game to be played Saturday at Western Kentucky University in Bowling Green. 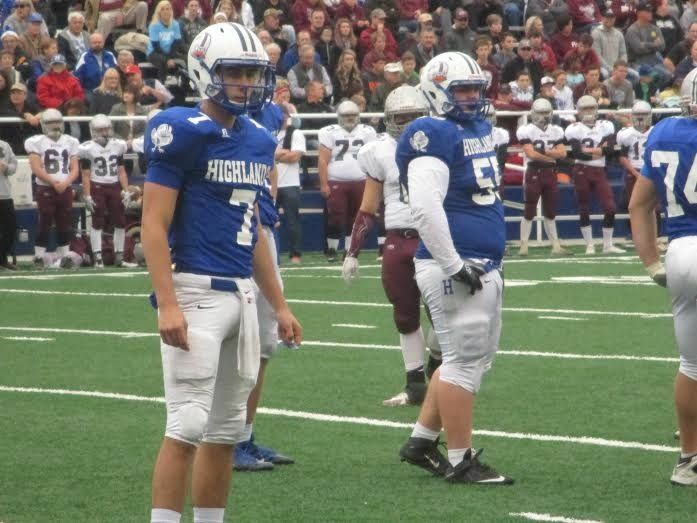 There will be no new state championship trophy added this year to the impressive collection at Highlands High School, as the Bluebirds gave up 27 unanswered second half points and lost to Pulaski County, 41-31, in the Class 5A semifinals in Fort Thomas on Friday afternoon. Highlands had been to the state championship every season since 2006, and at halftime it looked as if they had punched their ticket for another shot, but an epic collapse down the stretch turned the tide and ended the Bluebirds' season earlier than hoped for. Pulaski County head coach John Hines had a difficult time answering questions after the game as he shed tears of joy when asked to reflect on what it means to beat Highlands on the road. “I’m just proud of our team to come back and win on this field against that team, it’s a big deal in Class 5A football," he said. The Maroons take the trip to Bowling Green to try to win their third consecutive Class 5A title. The game was a tale of two halves as Highlands ran out like gangbusters and scored two touchdowns before the Maroons knew what hit them. On the first Bluebirds drive, running back Nick Kendall broke loose on a sweep play over 70 yards to set his team up nicely inside the 10-yard line. A few plays later, he punched it in from one yard to give the Birds a 7-0 lead. On Pulaski County's second drive, quarterback Riley Hall threw a nice pass to his top target Jake Johnson, but the pass went between his hands and tipped right to linebacker Jared Dougherty who took it back to the Maroons 10. Highlands was able to easily score on that turnover as well and darted out to a 14-0 lead. “We screwed up two or three times. We turned it over and gave them a touchdown, and then we screwed up again in the second half and put our defense in a bad spot,” Hines said. 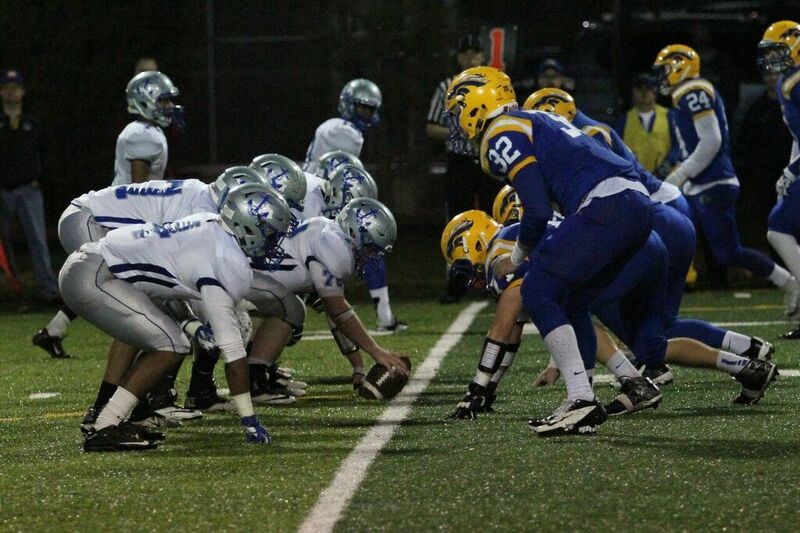 The two teams then swapped scores, each on a four-yard quarterback scramble. The Bluebirds offensive line dominated in the first half and gave Kendall plenty of room to bust through the line of scrimmage for some big gains. Kendall racked up 129 yards in the first half alone on the ground. On the Pulaski County side, starting running back Jaylon Conwell went down early with what looked like a very painful leg injury. He never returned to the game. His replacement became wide receiver George Gregory who found himself asked to do something new. “I don’t really play running back,” he said after the game. Initially, Gregory looked hesitant toting the rock and it showed up when the Maroons were stopped on fourth and short, but then scored his first touchdown on the next Pulaski drive from three yards out, narrowing the score to 21-7. Any momentum that they were able to build from the score, however, was quickly erased when Highlands struck back on a long gain on a Kendall reception in the flats where he ran loose for 25 yards, followed by a 39-yard bomb to Eric Miller into the end zone to make for a halftime score of 28-14. At that point, it looked like the game was all but over. Highlands had commanded the point of attack on both sides of the ball and looked like the better team in almost every facet. Things looked like more of the same immediately after halftime when Gregory fumbled on fourth and short and gave the ball back to Highlands at midfield. That mistake would only wind up with a Bluebirds field goal, however, and that is when the game turned completely around. Suddenly, Gregory began running with power and determination, leaping through holes and taking hits up the middle. If it wasn’t Gregory, it was wide receiver Jake Johnson making the difference. The comeback started with a terrific catch by Johnson in the end zone where he was double-covered but still managed to leap over his defender and come down with it for a spectacular touchdown catch. In a sign of possible desperation, the Maroons decided to try an onside kick that backfired and was easily recovered by Highlands, giving them a short field. The Bluebirds would not capitalize on it, though, going three and out and when they went to punt, it appeared that Dougherty mishandled the snap, and opted to try running for the first which he was not able to accomplish. The punting setback completely wiped out any advantage that Highlands gained by the botched onside kick. With the ball back, Gregory busted out for a 30-yard run and later scored on a direct-snap run from eight yards out, making what once seemed like an insurmountable lead into a 31-28 game. With the pressure mounting, the onus was put on quarterback Austin Hergott who did not necessarily shine in the spotlight. The first fatal flaw came late in the third quarter when he threw a terrible interception right in the gut of defensive back Christian Holman on a slant route. It gave the ball to Pulaski County deep into Highlands territory. Gregory scored on another direct snap following the turnover to give the Maroons their first lead of the game. For a non-running back, Gregory sure looked the part running the ball 23 times for 130 yards and four touchdowns. “Our offensive line really did a good job. I think we got their defensive line gassed a little bit, from chasing Riley around in the first half so we were able to punch some holes that we weren’t able to do early, and George was just running hard. George Gregory is a haus,” Hines said. Some panic began to set in, Highlands was faced with a fourth and three and found themselves down 35-31. They called a pitch play to Keller who was hit immediately in the back field for a loss and a turnover on downs. A few possessions later, with time running down and Highlands unable to manufacture anything on offense, the Bluebirds chances were completely dashed when Gregory plowed it in on another short gain for his fourth touchdown, putting the Maroons up 41-31. Highlands finishes their season at 8-6 after starting 1-5 but then winning seven in a row before losing on Friday.